"Here's a little magic for you..."
Back in the day�circa the mid-to-late 1970s—guitar whiz Steve Miller ratcheted up a fair number of mega hits. Lots and lots of hits. The 1980s weren't as receptive to his type of music, and as he tried to reinvent himself a couple of times, he sort of fell off the radar, as all musical acts must do as they give way to the new. That's not meant as a disrespect to Miller, that's just the way it goes. With this concert disc, recorded in 2007 at the sprawling outdoor venue Ravinia in suburban Chicago, it's as if the past 30 years or so never really happened. Sure, he's past 60, but he can still roll through his catalog of hits (and the obligatory blues homages) like a well-seasoned pro, and while his stage presence is fairly static it's not really all that much different than the handful of times I saw him live back in his prime. He comes. He sings. He plays. Not much in the way of jumping or moving around then, and certainly not now. Director Daniel E. Catullo III tries his best to make this Steve Miller show look more manic than it is by employing countless cameras and constantly cutting back and forth. There's even a camera that races from the back of the pavilion to the stage (and vice-versa), lending a sometimes dizzying effect that doesn't always match the bluesy tones of Miller's pop and rock creations. Miller is joined by a talented touring band that has largely been with him�in one form or another�for decades, with harmonica icon Norton Buffalo the most stable and recognizable fixture; there's a bit of rock history on display here too, as bassist Billy Peterson also played on Bob Dylan's Blood On The Tracks release. But what matters here are the hits, paraded out solidly and efficiently to a very, very appreciative crowd, interspersed with a few blues tunes (including the obligatory Robert Johnson Crossroads) to showcase his roots. While I might consider the blues portion to be the "go get a beer/go to the bathroom" segment had I been there, your mileage and appreciation may vary. Steve Miller: Live From Chicago is a pleasant enough way to revisit many of the big Miller hits�and I had truly forgotten how much I enjoy "lesser" tunes like Wild Mountain Honey and Serenade�though tracks like Jet Airliner or The Joker still remain on that imaginary list of songs I could easily go the rest of my life and never need to hear again. The crowd�who cross a wide, wide age span�appear to be gobbling this stuff up, so who am I to argue with Miller's success? Image Transfer Review: The concert is presented in a generally crisp, well-detailed 1.78:1 anamorphic widescreen transfer. There's not much room to complain here, as colors are bold and bright, while edges are sharp and the level of detail shows off every hair on Miller's arm. The frequent crowd shots suffer from some minor grain here and there, as does the occasional band member, but when this one is on its game it just looks gorgeous. Audio Transfer Review: A hefty set of audio choices, featuring 2.0 stereo, 5.1 SRS Circle Surround, 5.1 multichannel, and the big daddy: DTS. Working backwards, the DTS is the preferred option, delivering clean, deep bass and a dramatic sense of instrument separation that creates a big, spacious live texture. The 5.1 multichannel runs a close second in terms of clean separation of the various instruments, but just doesn't match the DTS for overall thump. The rarely utilized 5.1 SRS Circle Surround is conceptually designed to push 5.1 content so that it can be encoded in a stereo track, so that if a user doesn't have the right equipment, it will just come across as two-channel stereo. Audio equipment outfitted with a CS decoder will properly decode the signal and rebuild it as 5.1. The 2.0 stereo track is the red-headed stepchild here�nice but ultimately forgotten when compared to its beefier siblings. Extras Review: The presentation of this 3-disc set is handsome, from the embossed slipcover to the sturdy tri-fold case to the glossy insert booklet. It has a heavy, substantive feel, a suitable adjunct to Miller's long, successful career. The concert (01h:49m:23s) is relegated solo to Disc 1, cut into 21 chapters. Disc 2 carries two variations of the same general Miller documentary, both featuring radio host Joel Selvin (who also penned the Miller history in the included 8-page booklet). The first doc runs 19m:37s, and has Selvin and Miller in the back of a vintage cab, roaming the streets of Chicago tracing Miller's blues roots and reminiscing. It's an interesting history lesson, and this version of the doc is intercut with swooning fan comments shot pre-concert, as well as performance footage. Selvin In The City (23m:29s) is essentially the same general interview, here cut slightly differently and minus the fan chatter. Some obvious overlap between the two, but the second one seems a bit less fluffed. There's also a pair of automated photo galleries (one is barely hidden as an Easter Egg for dummies). 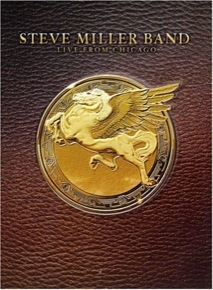 Disc 3 is an audio CD containing 12 Steve Miller tunes performed live. This is a nice bonus, and the sort of thing I wish other DVD concert releases would include. Miller fans should be quite pleased with the bonus materials here. It probably won't win over a new legion of fans, but if you're already a Steve Miller aficionado, this 3-disc set should be a real thrill. A nearly two-hour "best of" concert recorded in 2007 finds Miller presented in a rich DTS mix, and despite the unavoidable progress of aging, he somehow retains much of that famous melted butter voice of his. And there's all those hits. A bonus 12-track live CD is also included.